You and your little girl could be related you look so alike. What? those are the cutest pj buddies i ever did see. Monkey PJs!!! I love them! Oh My Goodness.. Way cute!! HA! Little Bit looks like she's totally humoring you in these pictures. "If I pose, mom is sure to leave me alone in a few, right?" Awww, I want those monkey jammies. Those are the cutest pj's! Oh gosh, I love it. PJs are so adorable. So cute! And I love Little Bit's little almost smile. Adorable! I LOVE freshly bathed kiddos! LOVE them. SO cute! 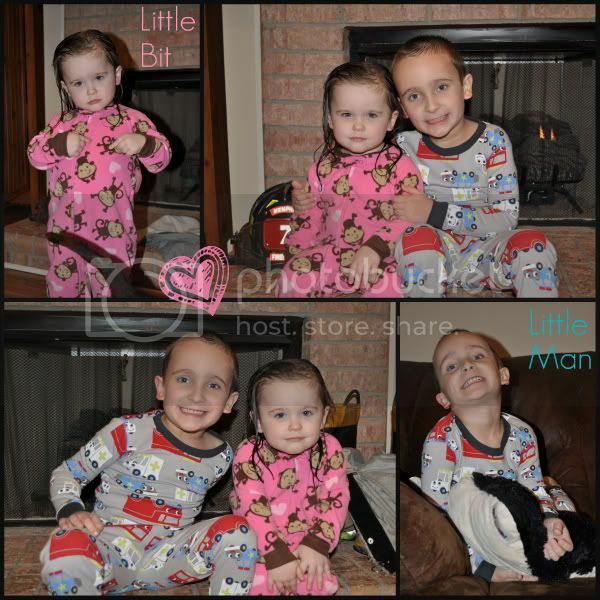 I love their pj's! I need those monkey PJs stat! For myself of course! I can't believe there's a pair of jammies out there with a firetruck that we don't own. Cute! Adorable kiddos! Love their PJS! this post makes me smile! !